Made with Acacia veneers and hardwood solids. French/English dovetailed drawers feature fully finis.. Dark merlot finish over a replicated mahogany grain. High gloss thick faux marble tops. Traditional ..
Price is set for Full/Queen Headboard!.. Price is set for Queen Bed!.. This queen sleigh headboard is the epitome of traditional decor. 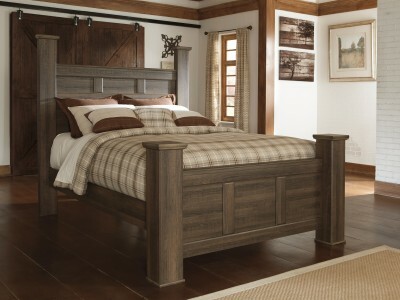 Louis Philippe-style moulding dates..
PieceSize (WxDxH)Seat (WxDxH)WeightQUEEN STORAGE BED66.25" x 90.5" x 68"NA x NA x ..
Get the look of posh barn wood without setting foot in a salvage yard. Replicated rough-sawn oak of ..
Vintage aged brown rough sawn finish over replicated oak grain. 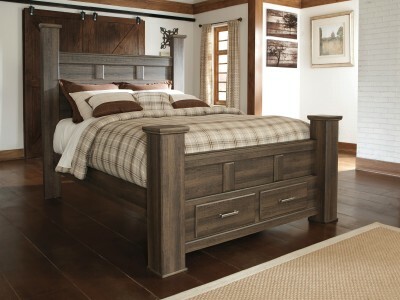 Large scaled rustic bedroom collecti..
Jennifer - Queen bedMade with select veneers and hardwood solids. Warm dark brown finish. Antique br..
Give your bedroom retreat a fresh take on vintage-inspired style. It's easy to appreciate every deta..